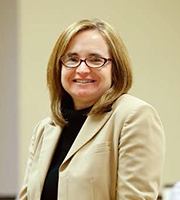 Dean and Professor of Law Rachel M. Janutis joined Capital in 2002. She teaches courses on Civil Procedure, Remedies, Complex Litigation and Conflict of Laws. Dean Janutis’ areas of research include civil procedure, remedies and complex litigation, specifically issues pertaining to jurisdiction, venue and punitive damages. Her casebook, Cases and Problems on Remedies, of which she is a co-author, has been adopted by numerous law schools across the country. In fall 2007, she was named Director of Faculty Development. In this role, Dean Janutis supported and promoted teaching and faculty scholarship. Dean Janutis served as Associate Dean of Academic Affairs from July 2010 to June 2014. Before coming to Capital, Dean Janutis served as a visiting assistant professor at the University of Illinois. She was an associate with Winston & Strawn in Chicago where her practice focused antitrust, contracts, business torts, and products liability. In addition, Janutis served as law clerk to the Honorable Harlington Wood, Jr. Circuit Judge for the U.S. Court of Appeals for the Seventh Circuit.